The original Liverpool Stadium was on Pudsey Street off London Road it was revered as one of the great boxing arenas of the early 20th century. 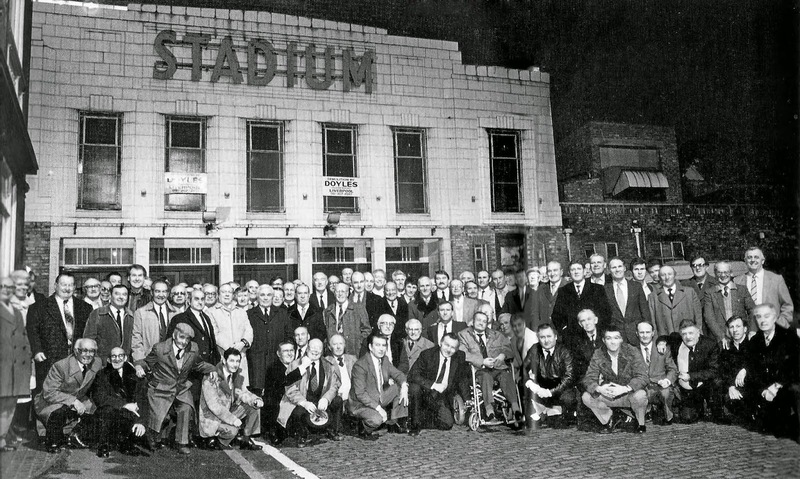 This was the venue in which Merseyside boxing enjoyed a tremendous revival after several lean decades, and where some of the city’s most illustrious home-grown fighters gained their reputations. 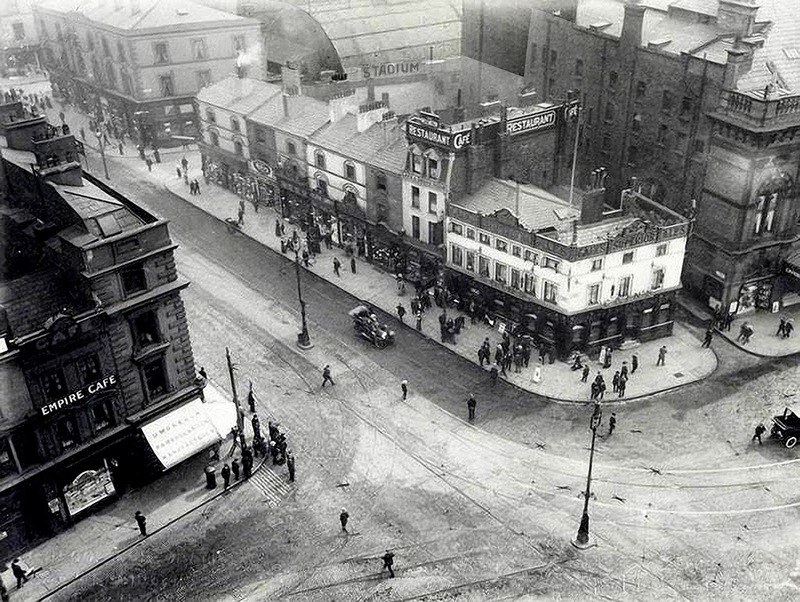 London Road 1913 fromWellingtons Column, showing the Stadium behind the Empire Theatre. The building was originally designed as stables for the Liverpool United Tramways Omnibus Company. It was taken over by the Council in 1897, and for a short while used as a roller skating rink. 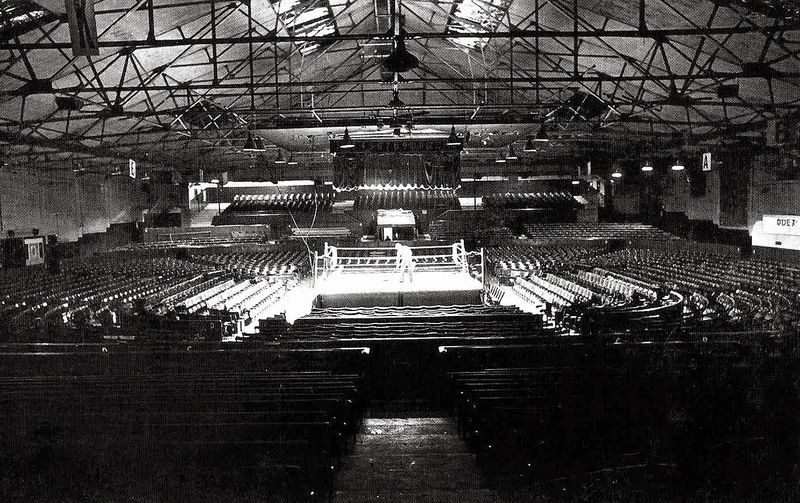 In 1911 it was converted into a 4,000 seat boxing arena under the control of a promoter, Major Arnold Wilson. At that time there were only two purpose-built boxing venues in Britain, in London, the National Sporting Club and in Newcastle, St James’s Hall. 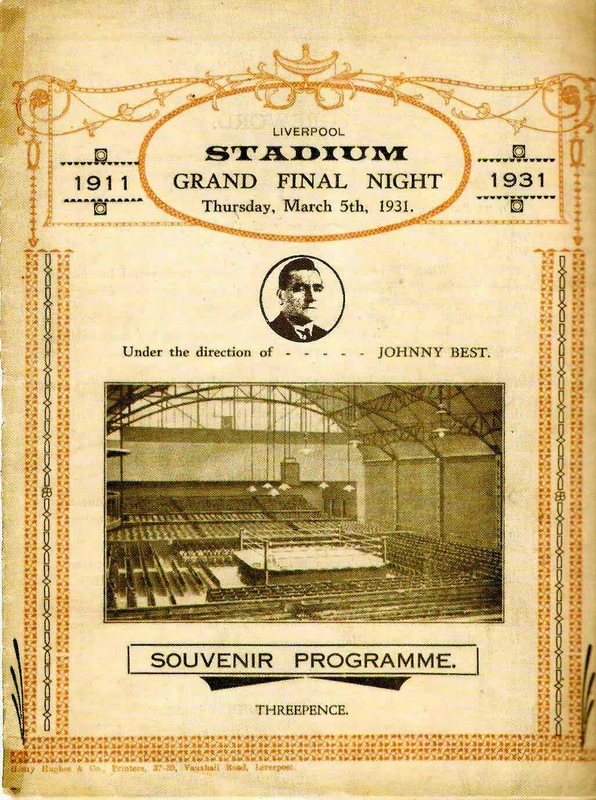 The Stadium opened in July 1911 in Pudsey Street and staged bouts every Thursday night. This tradition continued until its demolition to make way for the Odeon Cinema on London Road. 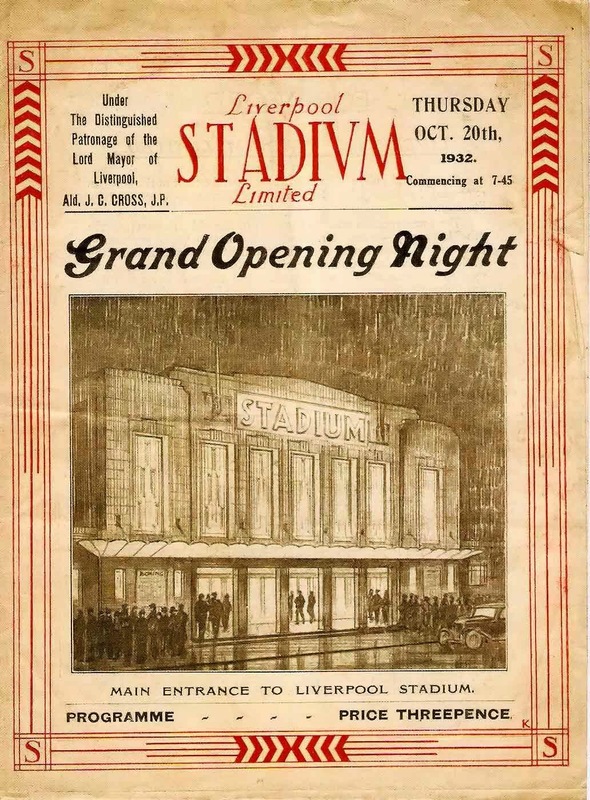 Its successor, the new Liverpool Stadium, was opened on the other side of the city centre. "The new Stadium, unique in conception and design, is an example of the modern style building. steel framed (of British Steel) and clothed with brickwork of a pleasing grey colour, with a large central feature faced in Terra Cotta. The roof is supported on steel trusses, and is the largest span of its kind in Liverpool, being 120 ft between supports. The levels of the main hall have been decided so that everyone has a clear view of the ring from any part of the building, and thus has arisen the saucer shape which was prevalent in the days of the gladiators." Of special note, added Kinna, was the 35,000 candle power lighting rig above the ring; its glare shielded from spectators by a suspended board showing the number of the round being fought. Also innovative was the actual ring Instead of ‘the usual buckets’, sinks were plumbed in under each corner, while the ring structure was designed to be easily dismantled so other events might take place, In the 1950s these included circuses, religious meetings, political rallies addressed by Winston Churchill and Clement Attlee. and informal classical concerts, aimed at workers deemed unlikely to attend the Philharmonic. During World War boxing shows were staged there to maintain morale, in 1944 there was a guest appearance by the US Army’s ambassador, world heavyweight champion Joe Louis (who, as a publicity stunt during his visit, signed for Liverpool FC). 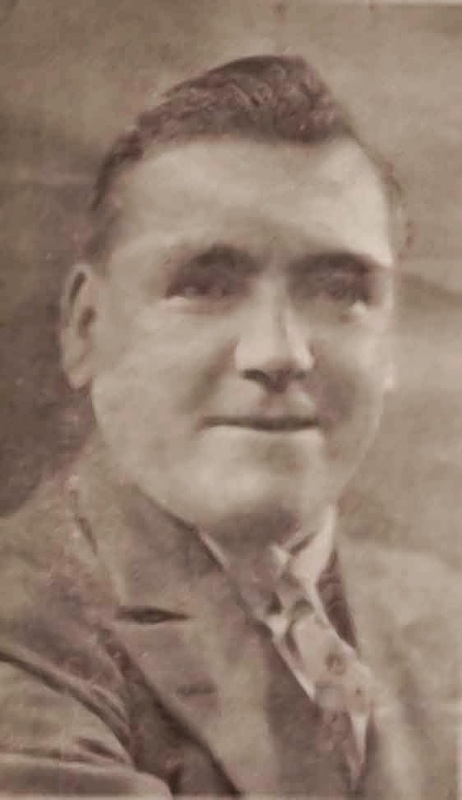 After Johnny Best’s death in 1956, his son, also John, took over as managing director. He was followed by John Moores, the Littlewoods chairman. Later, the Stadium staged wrestling bouts with some of the famous names of the day like, Adrian Street and Jackie Pallo. It also became a rallying centre for workers at the docks and at Ford’s Halewood plant during the protracted union battles of the 1970s. 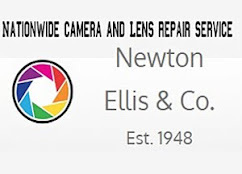 In addition it was a popular music venue, hosting concerts by Gene Vincent, David Bowie, Lou Reed and many others. Members of the Merseyside Former Boxes Association in Bixteth Street on the eve of the Stadium demolition in February 1987. 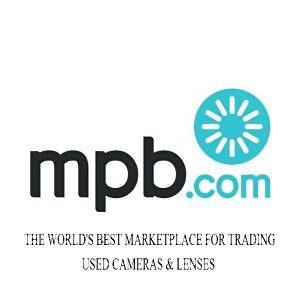 As British Wrestling’s popularity waned however and the building began to look forlorn after fifty years of extremely heavy usage, the final boxing match was staged at The Stadium in 1985. Following this the building closed for good and was eventually demolished two years later.